A dozen sauce-streaked plates sit between mounds of empty snail shells on the plastic tabletop; beer cans float on rivulets of melted ice; crusty breadcrumbs fall like snowflakes as hunks of baguette are torn away to mop up the sauces; T-shirts and toes are spattered with tamarind, lime, chilli, coconut and lemongrass; the floor around the plastic chairs is a mosaic of discarded crustaceans: This is the debris of a good night’s ăn ốc – snail eating. Other tables all around tell stories of similar indulgence. 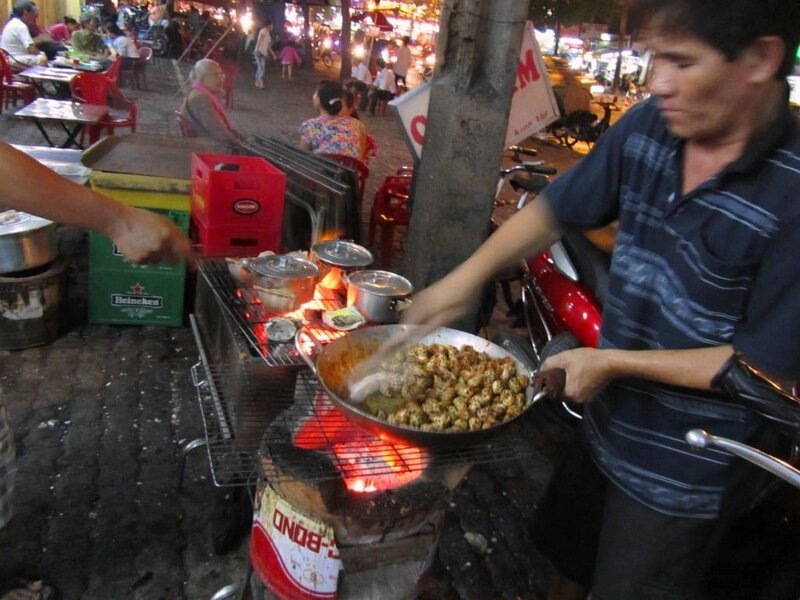 It’s Friday night, and all over the country hundreds of thousands of Vietnamese are out enjoying ‘shell tapas’. 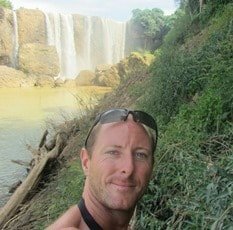 This is something every traveller and expat should experience. 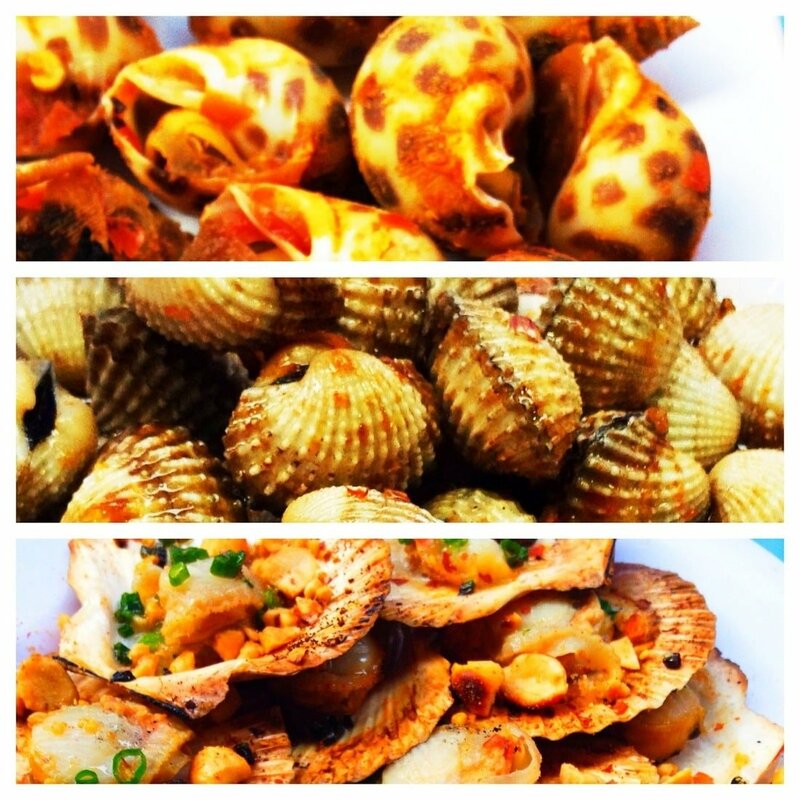 Below is my guide to eating, ordering and enjoying snails and shellfish in Saigon. On this page you’ll find an introduction to what snail eating is and why it’s so good; an explanation of how to eat and order these delicious, bite-sized morsels (including a menu decoder); a description of the kind of places where you can dine on all sorts of molluscs; and a list of some of my personal favourite quán ốc (snail eateries) in Saigon, including a map with them all marked on. How to Eat & Order? 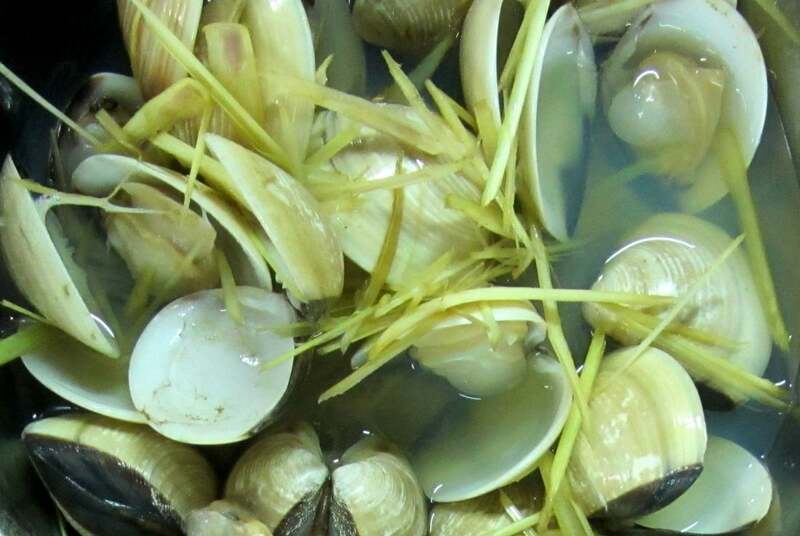 Ăn ốc – snail eating – is a national pastime in Vietnam. 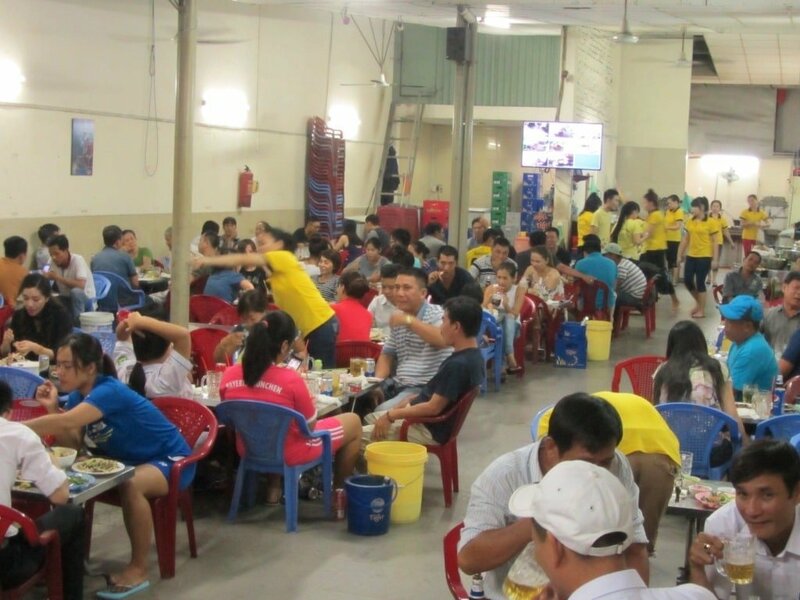 Every day of the week, but particularly on weekends, large groups of work colleagues, friends, and families descend on quán ốc (snail eateries) to eat, drink and talk the night away. Snail eating is part of nhậu culture, which is the Vietnamese word for going out, eating, drinking and socializing on an epic scale. It’s something between tapas and bar culture in the West, but neither of these do justice to the scale of indulgence and conviviality of Vietnamese nhậu. There’s a frenetic buzz to snail eating (always accompanied by beer) which is intoxicating and complete. I like to call it, ‘Total Dining’. Snails of all shapes and sizes come from Vietnam’s fresh water sources – flooded rice paddies, rivers and lakes – and from the ocean – the East Sea and, in the southwest, the Gulf of Thailand. 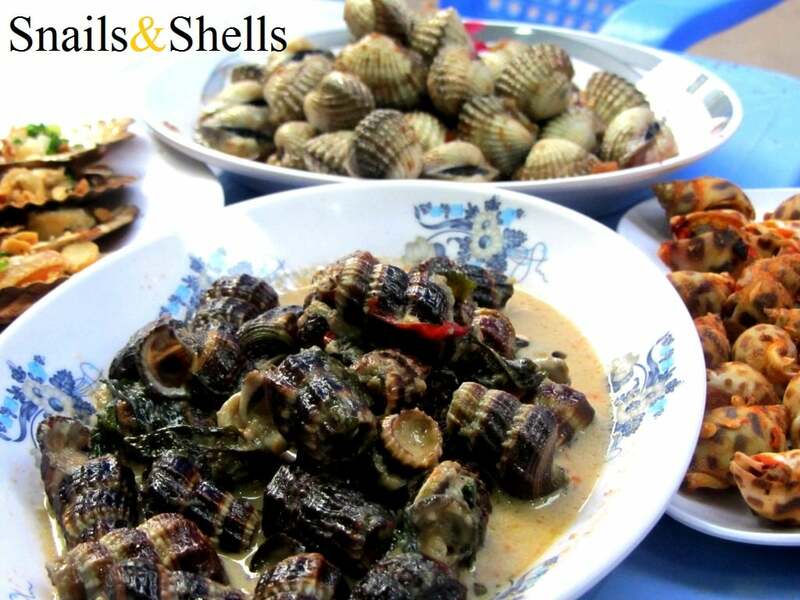 But quán ốc don’t only serve snails: anything that comes in a shell is on the menu. You’ll find clams, oysters, cockles, mussels, scallops, shrimp and other shellfish you’ve probably never even heard of or seen before. And there’s beer too: sometimes you’ll get bia hơi – ‘fresh beer’ – often brewed on the premises and extremely cheap (and weak), or you’ll find the local favourite of whichever province you happen to be in, as well as regional giants, such as Tiger Beer from Singapore. Snail eating has been around for a long time in Vietnam, and I’m happy to say there’s no sign of it diminishing in popularity in these rapidly changing and youthful times for the country. 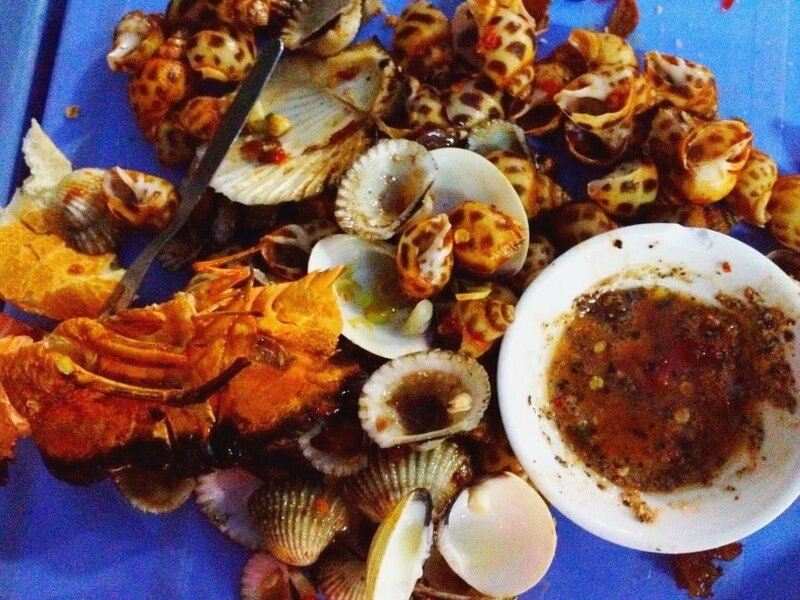 Quán ốc are usually packed with twenty-somethings digging into shells with tiny forks and wiping sauce from their mouths between bursts of conversation. One reason for the enduring popularity of snails is that they are such great beer food. Snails naturally come in small, bite-sized morsels, and, because you have to negotiate the shell in order to get to the meat, you can’t simply consume a plate in a few mouthfuls. This imposes a nice rhythm and tempo to snail eating that seems to encourage conviviality: pluck one from its shell, chew, swallow, wash it down with a sip of cold beer, have a chat with your friend and then repeat the process. Peanuts and a pint in a pub don’t come close. Over the course of an evening you slowly fill up with good food and drink, but never feel bloated. Snails and shellfish must be among the most ancient forms of ‘meat’ in the human diet, since they require minimum hunting skills and present little danger to the hunter. 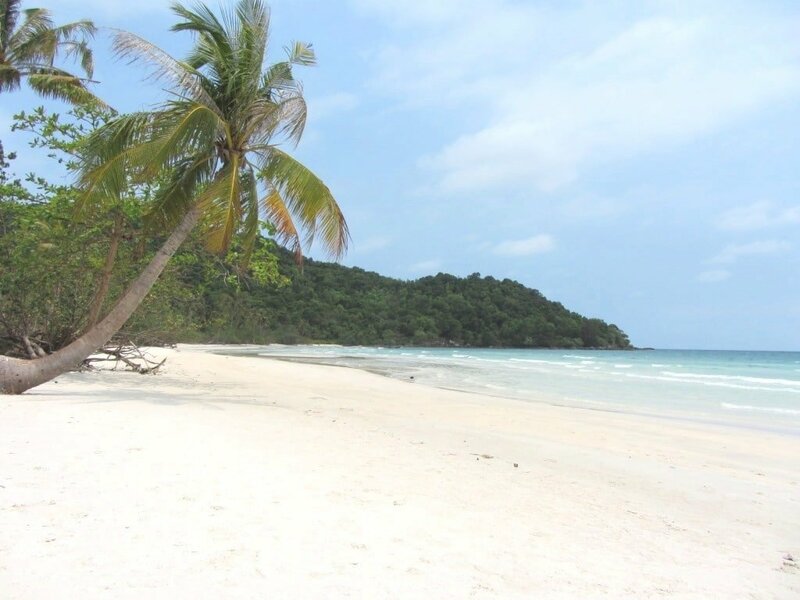 On a recent trip to the island of Phu Quoc, off Vietnam’s southwestern tip, my friend needed only to wade a few metres into the surf and dig her feet a couple of inches under the sand to produce a large ốc hương (a pretty little sea snail with a tabby-patterned shell) wedged between her toes. 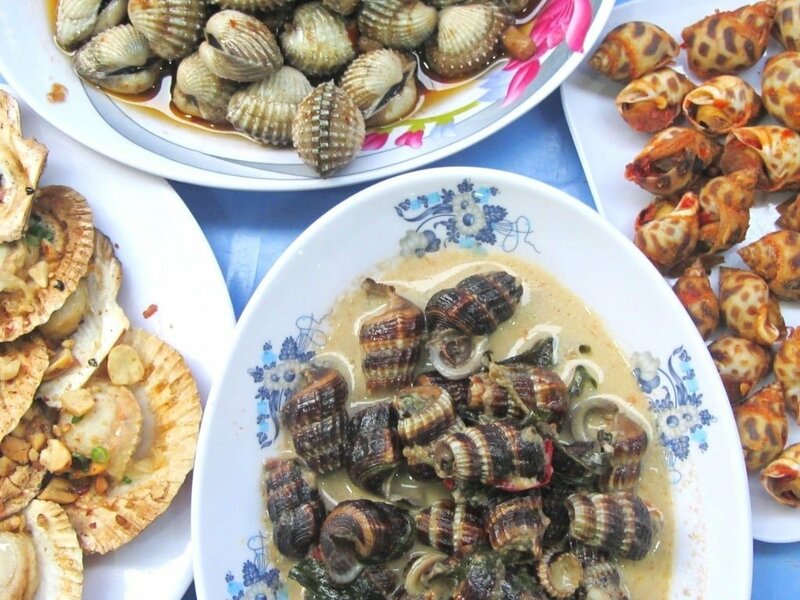 Although Vietnam was colonized by another famous snail-eating nation, France, the Vietnamese were feasting on molluscs long before the French arrived in southern Vietnam in 1859. 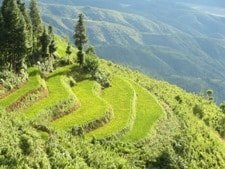 In the north-central province of Nghe An, big mounds of discarded snail and shellfish shells have been found dating back some 10,000 years. Even today, as you drive along some of the more deserted strips of Vietnam’s coastline, you’ll see piles of empty shells under trees on beaches where fishermen have snacked in the shade, presumably as they have done for many, many years. 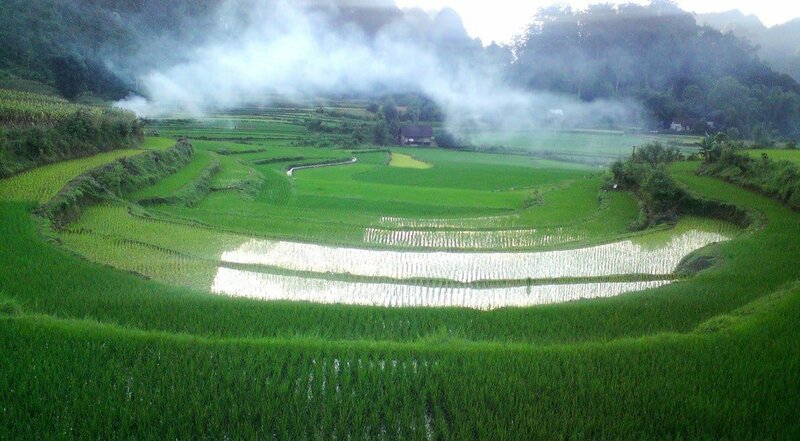 Vietnam’s ancient tradition of wet rice cultivation – which some researchers think may be where this practice began – provides another habitat for snails to live in, and has been a rich source of snails for thousands of years. Snail eating is all about sauces and textures. A ‘naked’ snail is a pretty boring, unappetizing prospect, but stuff it with spices and herbs and cover it in all sorts of rich, creamy, juicy sauces and you have a mouthwatering snack. Think of the famous escargot – French snails – which are essentially just a vehicle for garlic and butter. Vietnamese snails offer similarly rich sauces, albeit with regional ingredients and flavours, such as coconut, chilli and lemongrass. (Jump to my menu decoder for a list of snail varieties, sauces and ways of cooking). Texture is an essential component of Vietnamese cuisine. Snails can be gooey, chewy, slithery, slimy, or even crunchy. 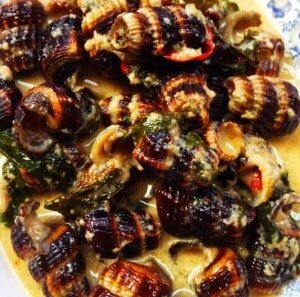 One texture beloved by Vietnamese and common to snails is the ‘chewy-rubbery’ texture. This is something that most westerners will have a hard time getting used to. 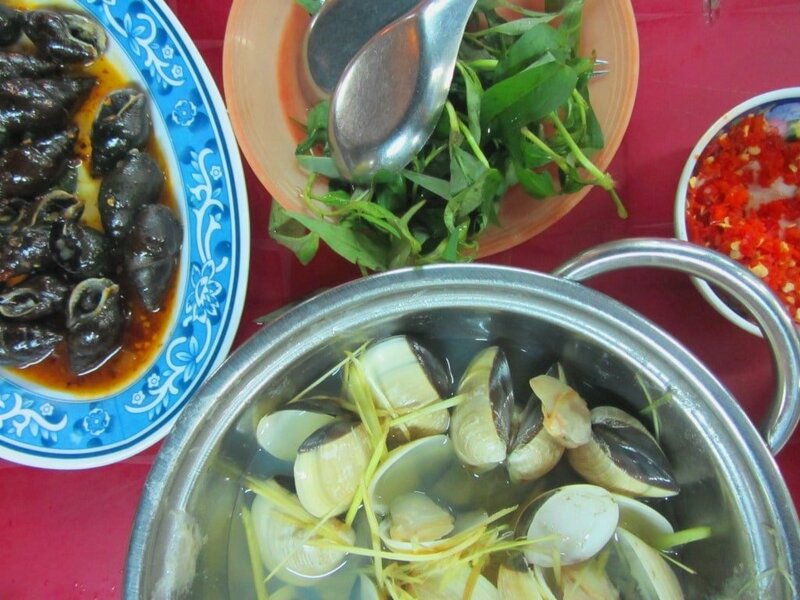 My advice is to trust the Vietnamese palate: people have been feasting on snails and shellfish here for thousands of years and they’ve gotten good at discerning which ones are the best. 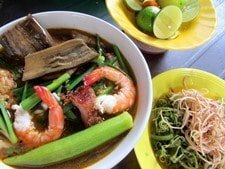 There’s usually a good reason why a dish that may seem repulsive to westerners, is beloved by Vietnamese, and (except in the cases where the food’s popularity is based on its supposed virility-inducing qualities or medical benefits) the reason is simply that it’s delicious. 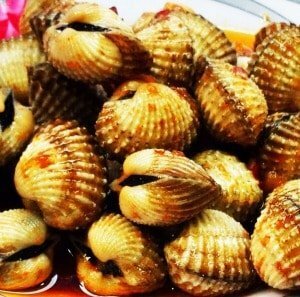 In the past, I had a big problem with the sea snail, ốc hương. 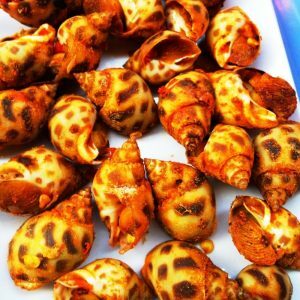 My friends couldn’t get enough of these pretty little snails fried in chilli and salt. I tried over and again to appreciate this bogey-like, chewy mollusc with its distinctive fishy aroma, but just couldn’t. Then, one day, very suddenly while I was doing something completely un-snail-related, it all made sense to me, and I just had to have a plate of ốc hương fried with chilli and salt. I understood the interplay between the spicy heat and the salty, fishy flavour, and how the chewiness served to keep these flavours in my mouth for longer. I suddenly got it, as millions of Vietnamese had done before me. Another big part of the fun of snail eating is getting dirty: snails are hands-on food. There are techniques for each mollusc – sucking, tearing, cracking, licking, picking and digging. Although you’ll be provided with utensils – ranging from forks to nut-crackers to safety pins – it’s your fingernails, lips, teeth and tongue that’ll do most of the work. Within a few minutes your hands and face will be covered in sauces, your shirt spattered like a Jackson Pollock canvas, and you’ll be waving the waiter over for more khăn ướt – wet tissues (unless, of course, you’re a Vietnamese woman, in which case you’ll magically manage to stay clean and pristine). Learn to love this mess, as it is part and parcel of the abandon of Vietnamese ‘Total Dining’. Now for the menu (if there is one). 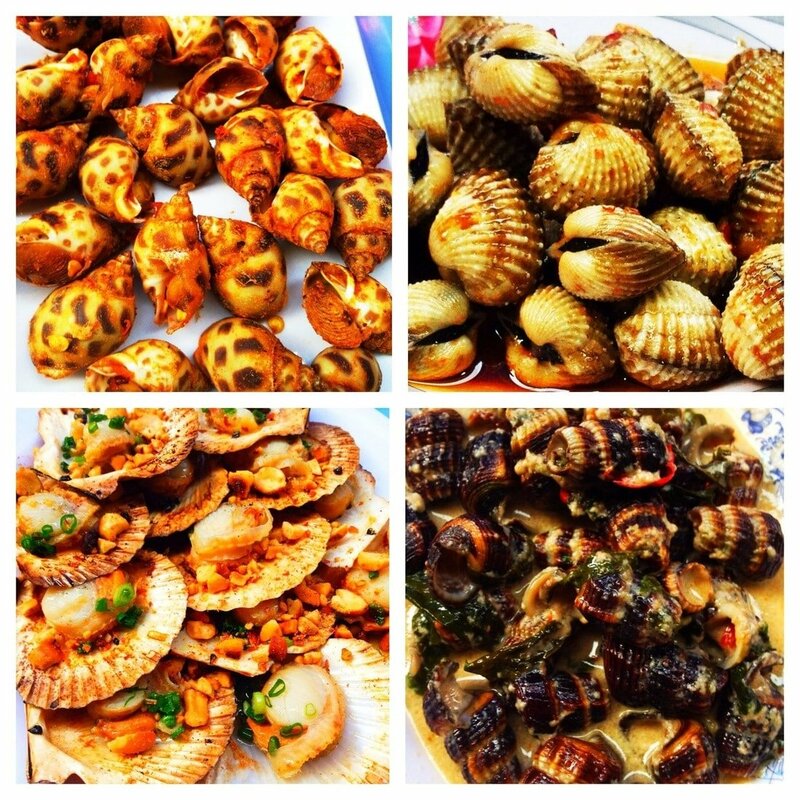 There are so many varieties of snails and shellfish that you’ll constantly be discovering new and delicious ones. The bigger eateries will offer over two dozen kinds, and even the small vendors boast at least a dozen. Then, there are several ways to have your snails cooked. Add to that the amazing number of sauces, and there’s enough choice to induce serious existential angst when it comes to ordering. However, most Vietnamese people tend to know exactly what they want before they’ve even sat down. Other dishes will be ordered as the night goes on, as the mood takes you, and as you sneak a peek at the interesting-looking crustaceans that arrive on neighbouring tables. 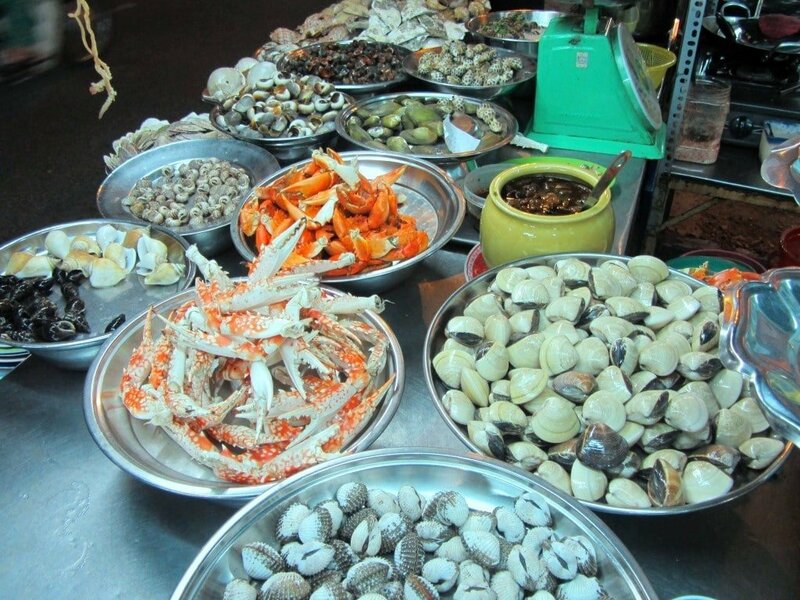 1: what type of snail, shellfish or seafood do you want to eat? 2: how do you want it cooked? 3: what sauce/flavours do you want it to be cooked with? Ốc Đào, one of the best snail eateries in Saigon, has an eloquently simple menu that illustrates how snails and shellfish are ordered, (although on a recent visit, the menu design appears to have changed, but the photos below still provide a good guide to ordering). There are two menus: the first is a list of all the varieties of snails, shellfish, and other seafood that are available. The second offers 3 ways of cooking and the many different sauces to choose from. Most places, if they have a menu at all, are very unlikely to have one in English. This is partly because snail eating is such a local pastime, but it’s also because of the problem of translating all the different snail and shellfish names. I even hear Vietnamese customers asking service staff to clarify what this or that particular snail is: “Is it from fresh water or the ocean? Big or small? Chewy or soft?” This is one reason why snail eating is an experience that’s best had – for the first time at least – with a local. 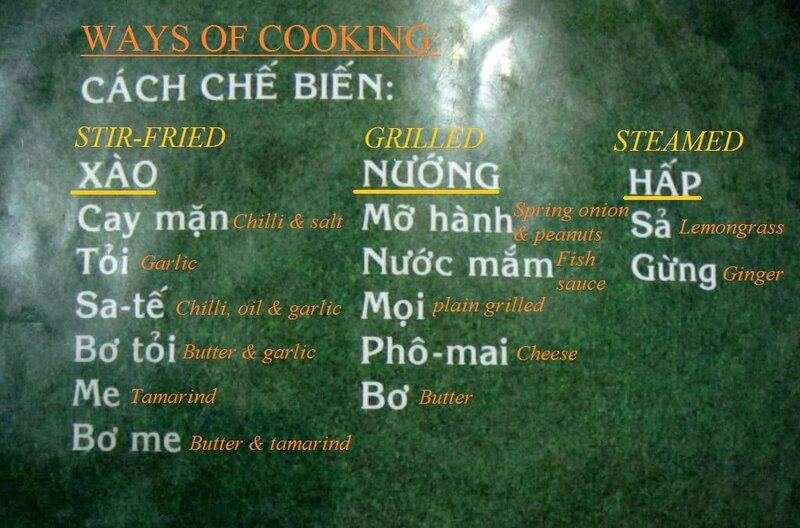 But, with the translated menu above and the following examples, you should be able to order a good meal. And you can always just have a look around for a table of happy diners and communicate to the service staff that you want exactly what they’ve got. 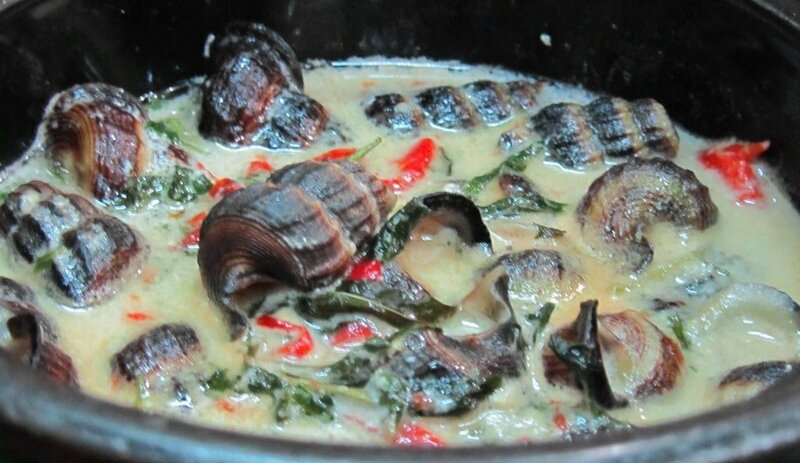 • Ốc len xào dừa – Mud Creeper sea snails fried in a mild green curry-style coconut sauce. 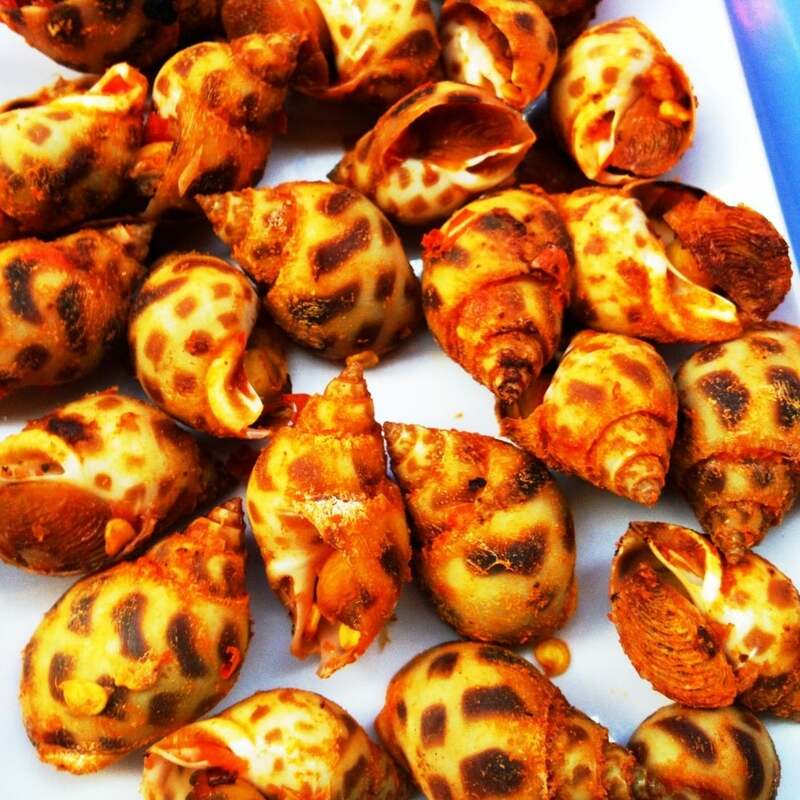 • Ốc hương rang muối ớt – Areola Babylon sea snails fried in chilli and salt. • Sò huyết xào tỏi – blood cockles fried in garlic. Rau răm – These raw, spear-shaped leaves will be the first thing to arrive on your table. Often referred to as Vietnamese Coriander or Hot Mint, they have a spicy-bitter bite to them. Vietnamese food strives for a balance of ‘hot’ and ‘cold’. This refers more to flavour than temperature. It’s the culinary equivalent of the concept of yin and yang. Snails are considered ‘cold’, so they should be balanced with the ‘hot’ flavour of rau răm leaves. I think of rau răm as a ‘chaser’ to neutralize the heavy richness of the snails: after swallowing a meaty, sauce-soaked mollusc, I pop a few leaves in my mouth to rebalance my palate. Muối tiêu chanh – The ubiquitous, simple and delicious accompaniment to all Vietnamese seafood, this is salt (muối), pepper (tiêu) and lime (chanh) mixed together in a little dish for dipping your snails and shellfish in. The sherbety tang of muối tiêu chanh really livens up each mouthful of food, and makes you wonder why you hadn’t thought of it before. 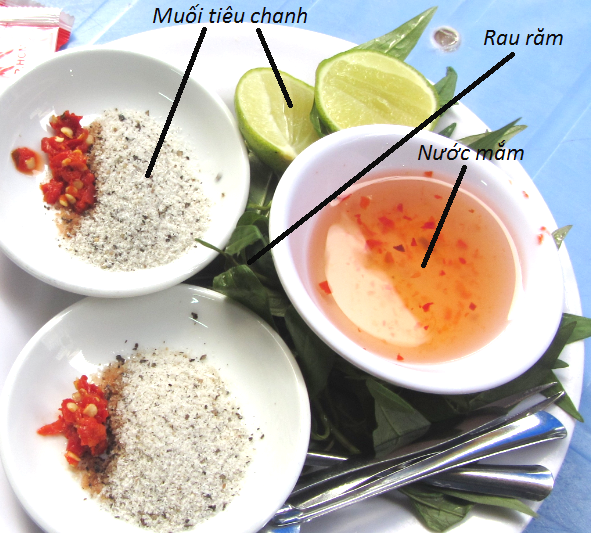 Nước mắm – The national condiment of Vietnam, fish sauce comes in many varieties. With snails you’re most likely to find nước mắm ngọt – sweet fish sauce, perhaps with a little chilli and garlic. Bánh mì – French-style baguettes – perfect for soaking up all the sauces. Bánh đa – Large, crispy, rice-flour ‘poppadoms’ with sesame seeds – great for texture and very cheap. Xoài – Sour mango. The clean, crisp flavour of this fruit goes really well with snails. Mango serves a similar purpose to rau răm – it cleans the mouth and sharpens the taste buds for the next hit of rich sauce. Đậu phộng – Peanuts. Always good finger food, peanuts are sold roasted, salted and crunchy, or boiled and soft. 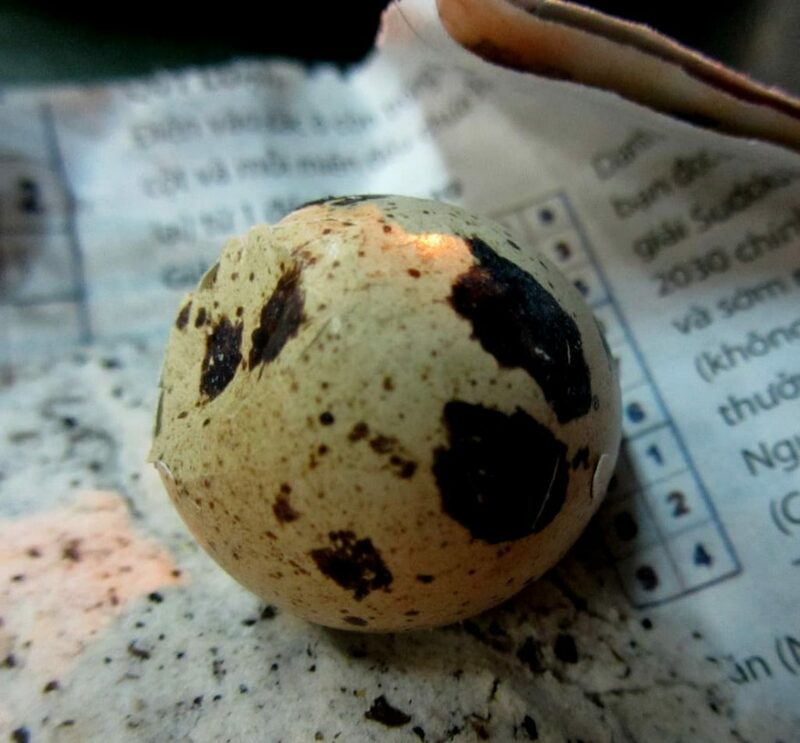 Trứng cút – Tiny, boiled quail eggs. The grey-spotted shells look like Cadbury’s mini chocolate eggs. These are little gems of protein and flavour, and great fun to eat. 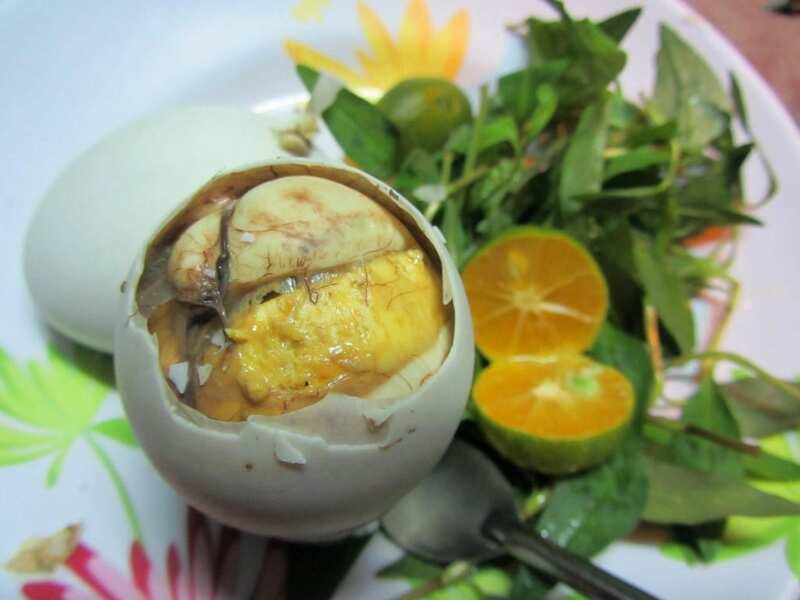 Trứng vịt lộn – Not one for the unadventurous, this is the infamous fetal duck egg. A fertilized embryo halfway to hatching is boiled and then eaten just as you would a boiled chicken’s egg. It took me a long while to appreciate this snack, but it is (of course) delicious. People all over Southeast Asia love it. Remember to add a tiny teaspoon of muối tiêu chanh into the shell, and definitely ‘chase’ it with some rau răm leaves. If you like eggs then you will, eventually, like fetal duck egg, because it is simply ‘eggier’ than a normal chicken’s egg. An interesting alternative is fetal duck egg de-shelled and fried in sweet-sour tamarind sauce – trứng vịt xào me. 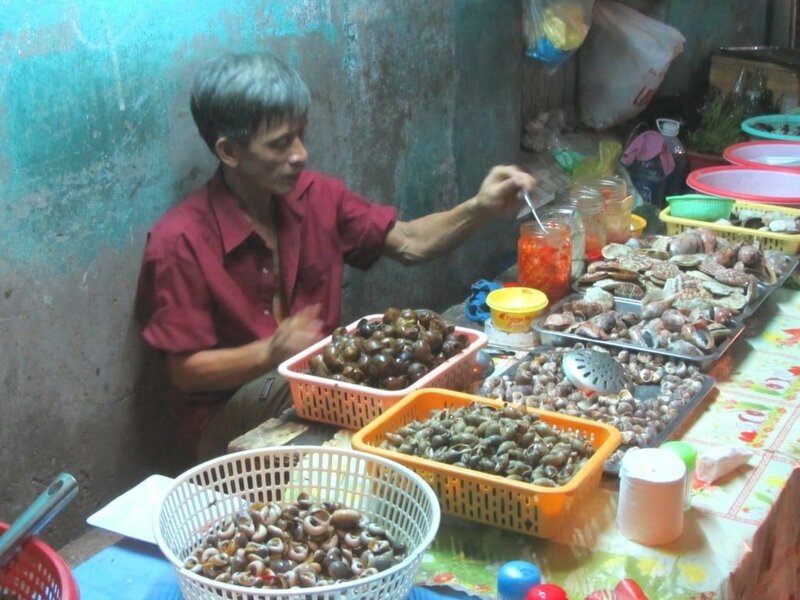 Quán ốc (snail eateries) are found in all cities, towns and villages in Vietnam. They run the gamut from gigantic, rave-sized spaces inside corrugated iron hangars filled with a cacophony of chattering voices, clinking glasses and cracking shells, to intimate two-table street stalls that occupy a quiet corner of a lonely alleyway, under the white glow of a single naked light bulb. 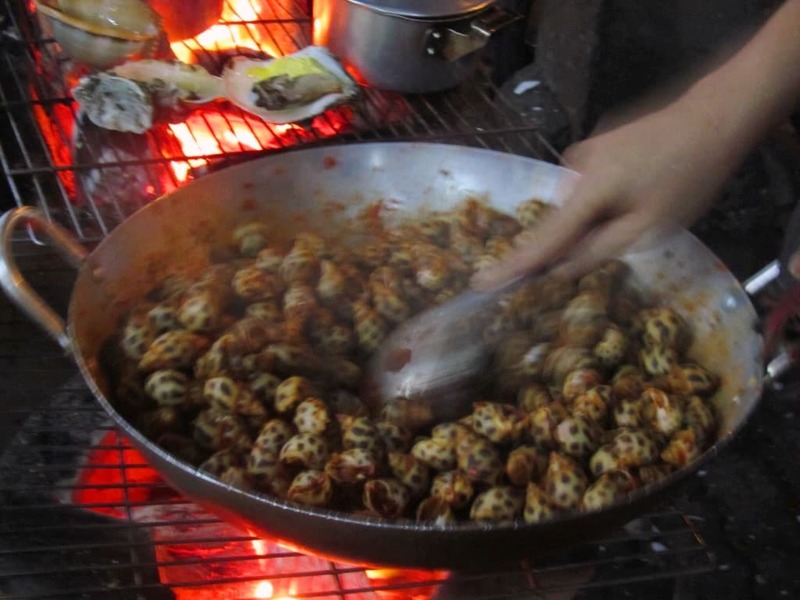 (Jump to Locations to read about my favourite places to eat snails in Saigon). 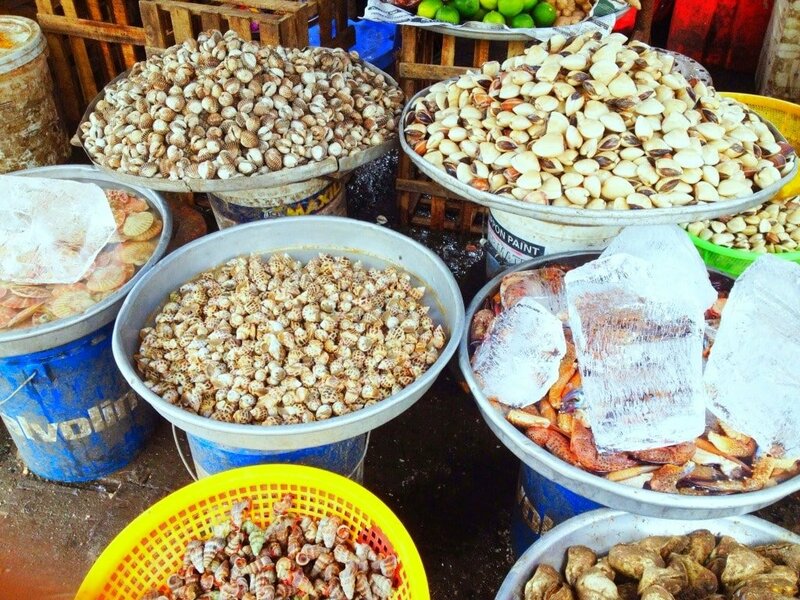 Look for signs saying Quán Ốc or simply Ốc, with a smokey charcoal grill out front next to a display of the day’s snails and shellfish, laid out in plastic baskets and metallic bowls. Snail eating is extremely popular, and Vietnamese are usually very discerning about where they eat: follow the crowds and there’s a good chance you’ll find some tasty molluscs. But don’t dismiss the smaller ones: if a street-side vendor only has two tables, which are both regularly occupied, take that as a sign of quality. Apart from following the crowds, there are two things that make a good quán ốc stand out. First is the freshness and quality of the snails: are they proudly displayed in all their glory in front of the eatery to entice passers-by, and are they cooked-to-order within sight of your table? Second is the quality of the sauces: a bog-standard place will throw fistfuls of salt, sugar, chilli and MSG in their sauces to quickly arrive at sweetness and flavour, but a good snail eatery will achieve this with a more restrained use of the above ingredients and more subtle infusions, such as tamarind for sweetness and herbs for heat. Perhaps more than any other Vietnamese food, snails are all about flavour and atmosphere, not décor. Ambience is created by the quality of the food and the infectious buzz of lots of people thoroughly enjoying themselves, not new furniture and cutting-edge interior design. As with other popular dishes, such as phở and cơm tấm, eateries which lure you in with glistening tabletops, cushioned chairs and any general attempt at trying to make the place look nice, are usually (but not always) best left alone. 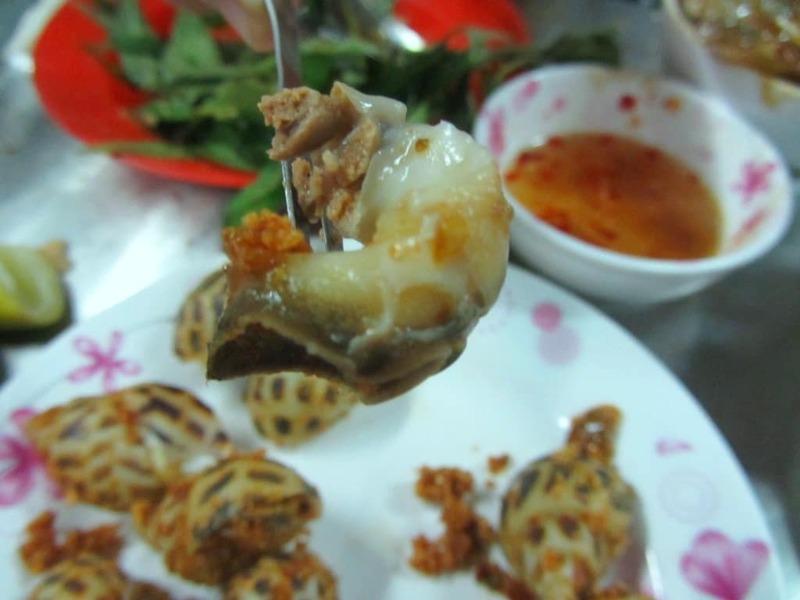 Several years ago, I had the misfortune to visit one of Saigon’s ‘famous’ snail eateries. However, I experienced gruff service, overpriced dishes, sauces loaded with MSG and (I should have known better) indoor seating on soft chairs surrounded by widescreen TVs. 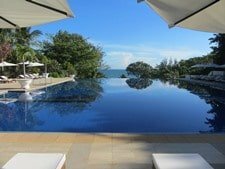 My friend and I came to the conclusion that its reputation must have been built on the fact that some glamorous Vietnamese celebrities used to frequent it late at night. Whatever the source of its ‘fame’, it certainly wasn’t the snails. 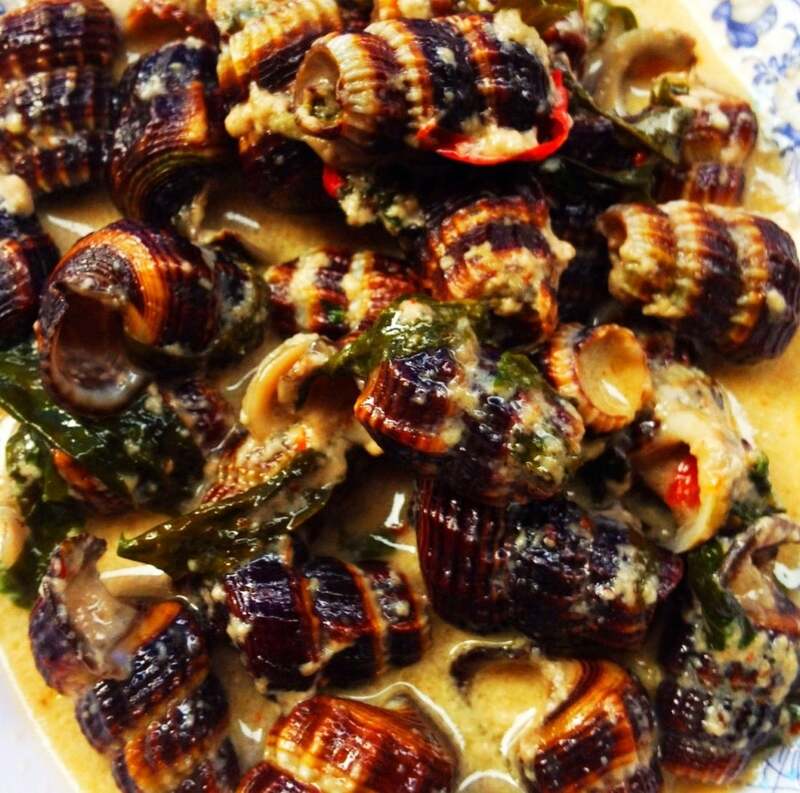 For me, there is such a time as ốc o’clock – the best hour of day for eating snails. This is around 5pm, when the light and humidity are low, and people are turning their attention from work to play. At this time of day there is a steady trickle of customers, but not the crowds that will begin to arrive as the evening wears on. Quán ốc are generally open from the early afternoon until very late – some proprietors tell me they remain open for as long as their customers stay. 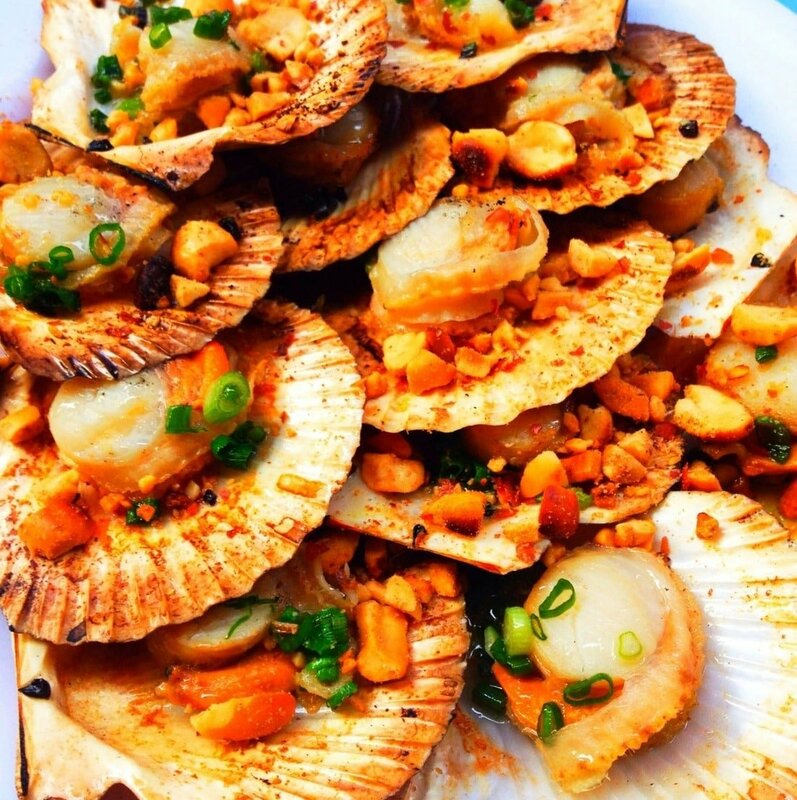 Ốc Châu: 159 Ngo Thi Thu Minh, Tan Binh District [MAP] – Spectacularly good food, massive variety, and a cacophony of cracking shells, clinking beer glasses, boisterous banter – you can hear the happiness – make Ốc Châu my current favourite. It’s a marvellous example of informal Vietnamese dining. Located in Tan Binh District, this quán ốc is far from downtown, but that doesn’t stop locals descending on it, especially on weekends. Its ‘restrained’ décor – bare walls, corrugated iron roof, linoleum floor – is a sure sign of good quality, because it’s all about the food. 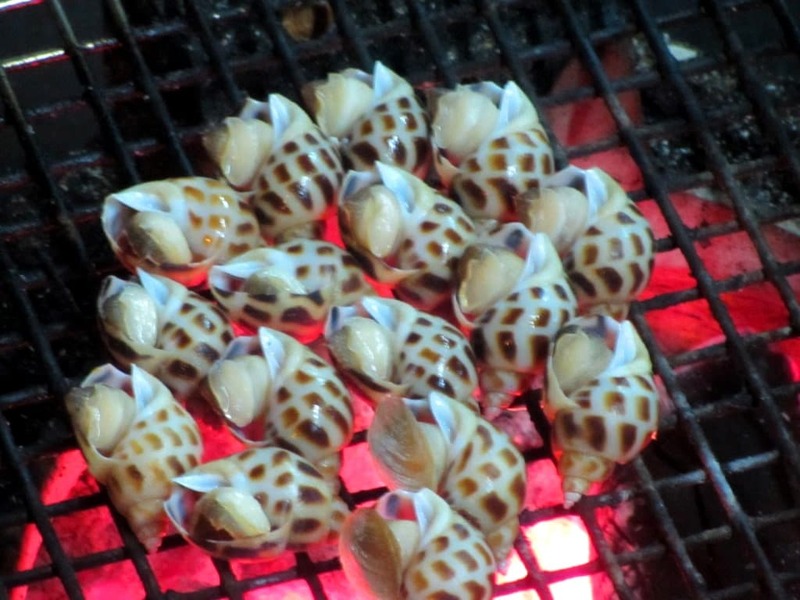 Shells are grilled, steamed and fried in plain sight. When the stark interior fills up with customers, plastic tables and chairs spill out on to the pavements to accommodate the crowds. Love it. Ốc Đào 1: 212B/C79 Nguyen Trai, District 1 [MAP] – Outstanding quality, variety and atmosphere, Ốc Đào 1 isn’t easy to find (off Nguyen Trai Street, folded in a maze of back-alleys) but it’s well worth the effort. Always busy, always delicious, always some new, strange and exotic mollusc on the menu, this place is known to most Saigon shell-lovers. 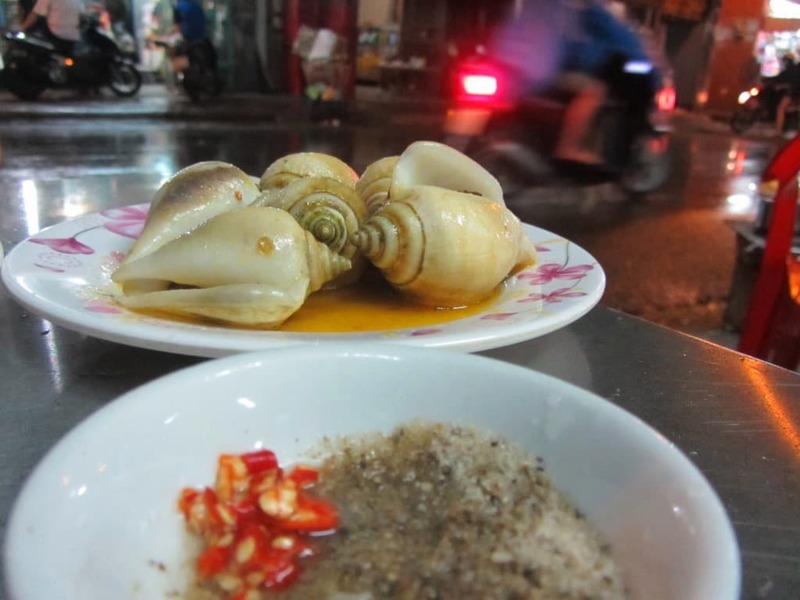 Try the ốc hương rang muối ớt – fried Areola Babylon sea snails with chilli and salt – as they are particularly good here. Ốc Đào 3 (18 Troung Sa, Phu Nhuan District; MAP) opened a few years ago. The location is good but the premises are a little bit cramped. Ốc Oanh: 534 Vinh Khanh, District 4 [MAP] – Intense and raucous, this place is hugely popular with Saigonese on a night out. 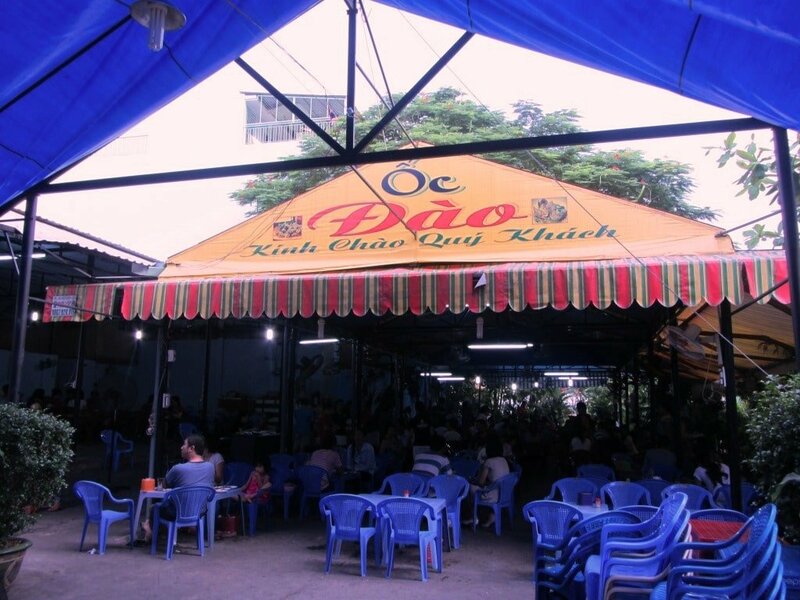 Vinh Khanh is one of Saigon’s best street food streets, and Ốc Oanh is the brightest beacon of them all. The electrifying atmosphere alone is reason enough to come here, but the food is equal to the ambience. Prices are higher but portions are larger than most places, so you get value for money. It’s spectacularly good, loud, local fun – you’ve got to come here. Ốc Chút Chít: 285/36/1 Cach Mang Thang Tam, District 1 [MAP] – Rammed with youth every night of the week, be prepared to wait at least 15 minutes for a table at this popular, no-frills snail and shellfish eatery. Dozens of small tables and chairs line both sides of the narrow alleyway here: vehicles pass between tables, and the whole street is engulfed in smoke from the grills and barbecues. Be warned, if you’re over 25 years of age, you may well be the oldest customer here. The food is simple, fast, fresh and delicious. Quán Bé Ốc: 58/53 Vinh Khanh, District 4 [MAP] – Yet another brilliant snail eatery on Vinh Khanh Street, Bé Ốc caters to a slightly older, beer-swilling crowd than other places in this list. The menu is extensive, portions are large, all dishes are full of flavour, and the location – at the north end of Vinh Khanh – is nice and quiet. Ốc Mập: 400 Ba Hat, District 10 [MAP] – A busy little place in an area chock-full of great street food, Ốc Mập hums with activity deep into the humid night in Saigon’s Chinatown. Quality is good, portions are a bit small, but prices are lower than most places in this list. Ốc Tinô: 391/7 Tran Hung Dao, District 1 [MAP] – Occupying the corner on a quiet alleyway, Ốc Tinô is a clean, fresh little snail eatery that’s quietly made a name for itself. There’s a pleasant, relaxed atmosphere here (a nice change compared to the noise of larger eateries), which makes it less ‘scary’ than some of the others in this list. Sit back in a plastic chair and enjoy a range of shells, all livened up with spices, herbs, leaves and sauces. 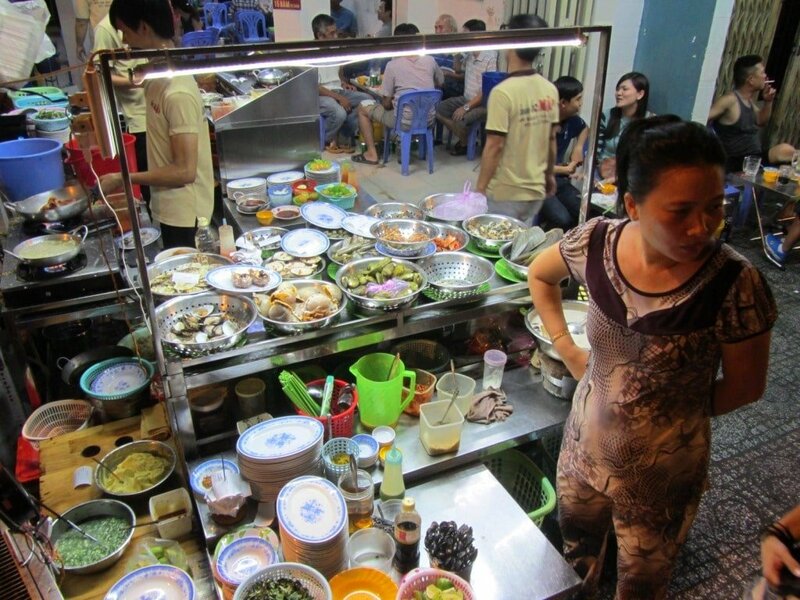 ‘Snail Street’: Nguyen Thuong Hien Street, District 3 [MAP] – This is where Anthony Bourdain came to sample some snails back in 2009. Nguyen Thuong Hien is indeed a ‘snail street’, but it’s just one of many, and although I’d happily eat at any of the quán ốc here, I also suspect that its reputation is somewhat overblown – sauces are a bit too heavy on the MSG. But the atmosphere at night on this small street is great, and it’s central and easy to find. Út Trang: 108B Pham Viet Chanh, District 1 [MAP] – You can’t miss the striking black and orange signage of this place in District 1. It’s small but popular, and the traffic streams by just feet away from your food. Young couples, groups of friends, and whole families all dig into the various shells on offer. Presentation has been particularly nice here whenever I’ve sampled it. Ốc Tre Một: B10 Thanh Thai, District 10 [MAP] – This section of Thanh Thai Street, in District 10, has a number of big quán ốc that see a steady flow of young Vietnamese from early evening into the small hours. Ốc Tre Một is one of the biggest and busiest. The road here is as wide as a highway but sees relatively little traffic at night, which allows street performers room to strut their stuff: Michael Jackson impersonators dancing on yellow lines, kid flame-eaters blowing fire from the tarmac, and amateur karaoke performances blasted out from an amp on the back of a motorbike – oh, and the snails are pretty good too. 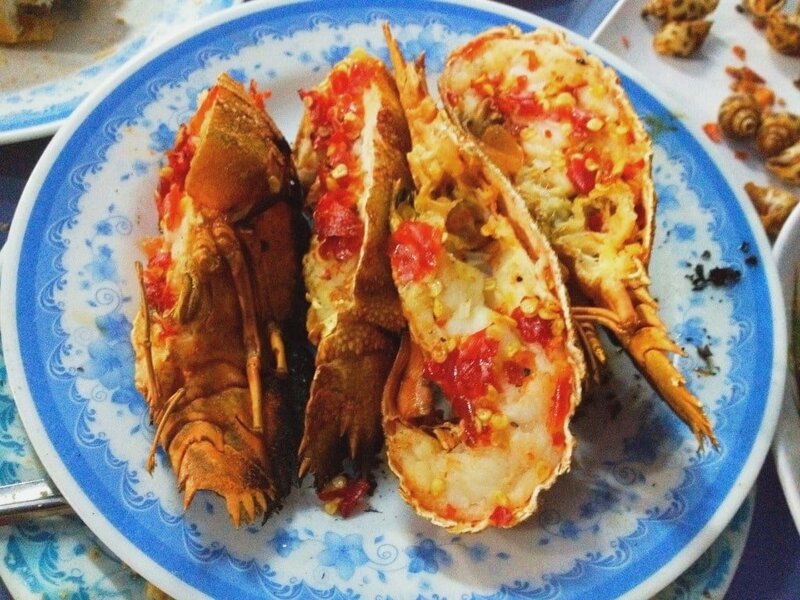 This entry was posted in ALL, FOOD & DRINK, Seafood, Street Food, Weird Food and tagged blog, guide, Ho Chi Minh City, Saigon, seafood, shellfish, snails, street food, Vietnam. Bookmark the permalink. A very good article it is, very detailed and literally made me want to go eat after work! 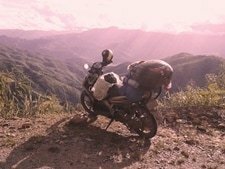 Thank you for sharing your love & experiences in Vietnam that not many VNmese people could. Thanks Tom, just had a few dishes at a oc place in district 12. Your advice was invaluable and I even took a chance on a crab dish that I wasn’t sure how it would come, but it was fantastic. Thanks again. That’s great! Glad you enjoyed your shells feast 🙂 Crab sounds delicious. Great article and a fantastic list of recommendations. 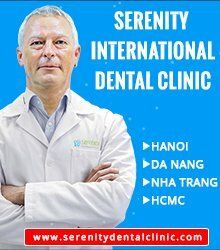 We have only been to a couple of those that you mention…I can see us exploring a few of your haunts on our next visit to HCMC 😉 My wife & I are also big fans of Oc Nhu which is located up a hem on the corner of Nguyen Thien Thuat and Dien Bien Phu. Having left Vietnam a few years ago, reading about snails reminded us of something that we sorely miss! I hope you get a chance to come back to HCMC soon and go snail eating again! Do you know what “Sò Mai” is called in English? Perhaps you should clarify that we don’t eat ốc sên which are the snails that most people think of when they think of “snails”? 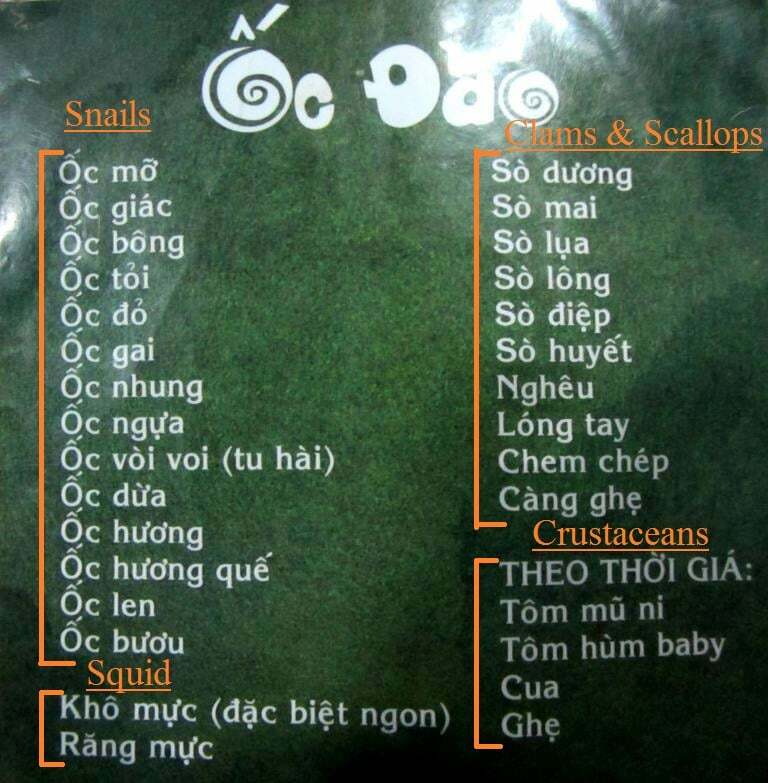 Since in English they don’t have names for snails that are commonly used whereas Vietnamese differentiates between them, for example ốc dừa is different from ốc vít? I’ve never seen a Vietnamese person eat ốc sên, and have never tried this. Thanks for your comment. 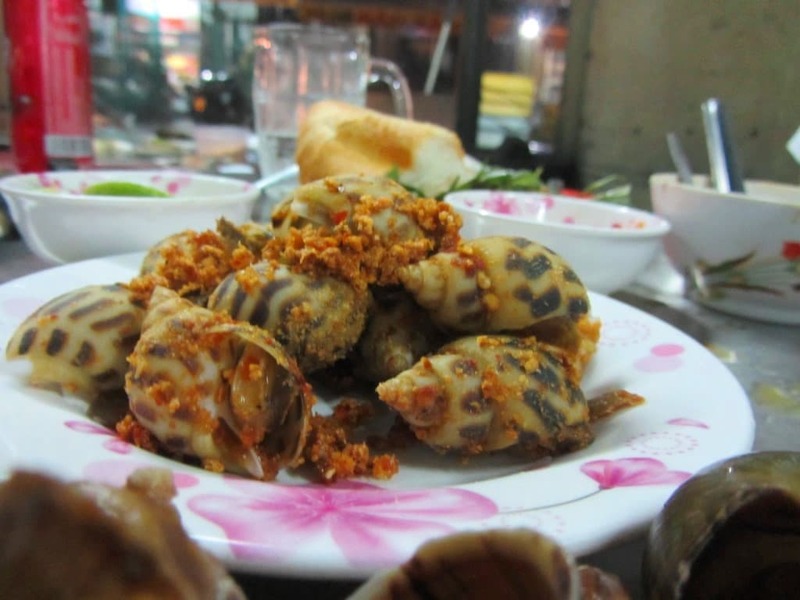 I think that, despite all the different varieties of snails, most people would still recognize ốc hương, ốc dừa etc as ‘snails’, so for the purpose of this article it is easier to refer to all ốc as ‘snails’. Really exquisite and elaborate on how we eat Ốc with some accompanied herbs and various dipping sauce. My tips, use the tooth-pick instead, and you don’t have to be messy when eating Ốc with your hands to be Supa Dupa tasty. 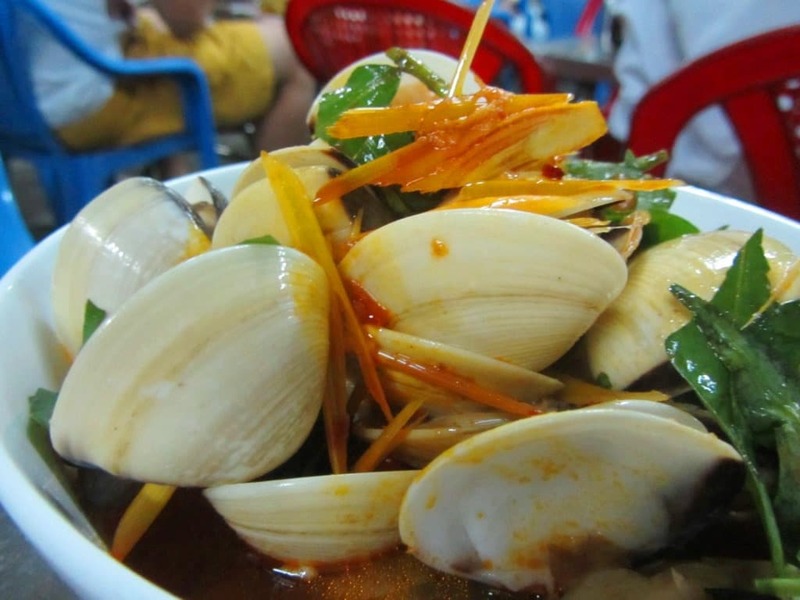 And with some dishes we just eat and gulp down the broth , for instance “Nghêu hấp Thái, or Nghêu hấp xả” (steamed clams with lemongrass and ground chili) really satisfy you, a extraordinary gourmet. It’ll be very terrific. I’m from Saigon, Vietnam. Anyway, thanks for your interesting post, really appreciate.